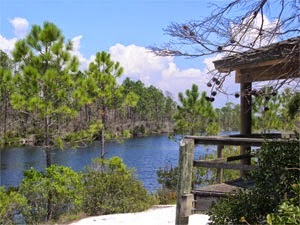 Located on the Florida Panhandle just ten miles west of Pensacola, Big Lagoon State Park nhas 705 upland acres that separate the mainland from Perdido Key and the Gulf of Mexico. Natural habitat from saltwater marshes to pine flatwoods attract a wide variety of birds, especially during the spring and fall migrations, while the beaches, shallow bays, nature trails and open woodlands offer splendid opportunities for natural habitat. The park also beckons visitors to camp, swim, fish, boat, canoe and hike. Crabbing in the shallow waters of Big Lagoon has also become a popular activity. The West Beach picnic area, shaded by pines and oaks, is just the place to enjoy a relaxing meal on the waterfront. Big Lagoon State Park the northern boundary of Big Lagoon as it snakes toward Pensacola Bay to the east. Grande Lagoon and its minor tributaries lay within the boundaries of the park, as does the alligator-inhabited Long Pond, a man-made freshwater pond. The park is a 'gateway site' for the Great Florida Birding Trail, featuring 9 distinct natural communities including estuarine tidal marsh, mesic flatwoods, wet flatwoods, and is dominated by scrubby flatwoods. Additionally, the park features a number of threatened and endangered species such as the Large-leaved Jointweed, Gopher Tortoise, migratory shorebirds such as Snowy Plover, Least Tern among some twenty other listed species. Perdido Key Vacation Rentals, Attractions, Activities, etc.